Forward the (R)evolution - in Harmony with the Earth: Almost there! Guatemala and Belize! Almost there! Guatemala and Belize! It is always when things come harder that one can find the best alternative to it. We tried everything to cross from Honduras directly to Belize thinking we would have to pay at the border with Guatemala. 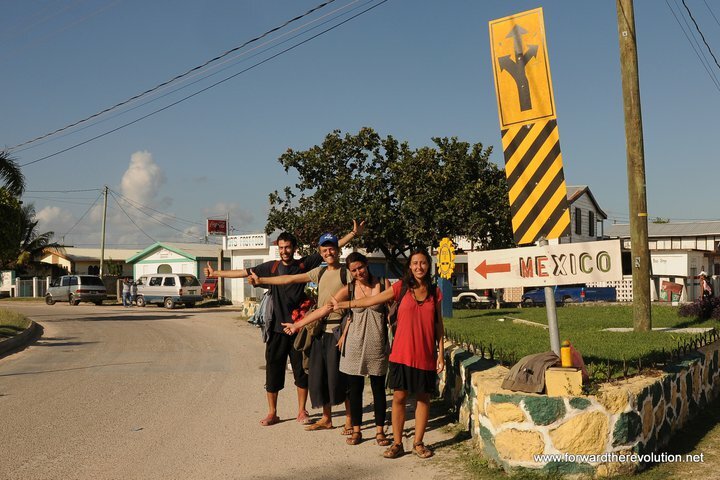 We got there in no times, hitchhiking is so easy in Honduras…and actually in all central america. At the border, we meet this once and friendly customs officer. He listen to our story interested and simply accept to give us an exemption for the tourist tax. If all customs officers were like him, traveling without money would much easier! 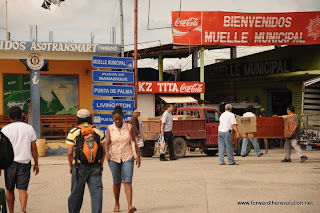 Quickly we find another ride and we get to the closest town, Puerto Barrios. 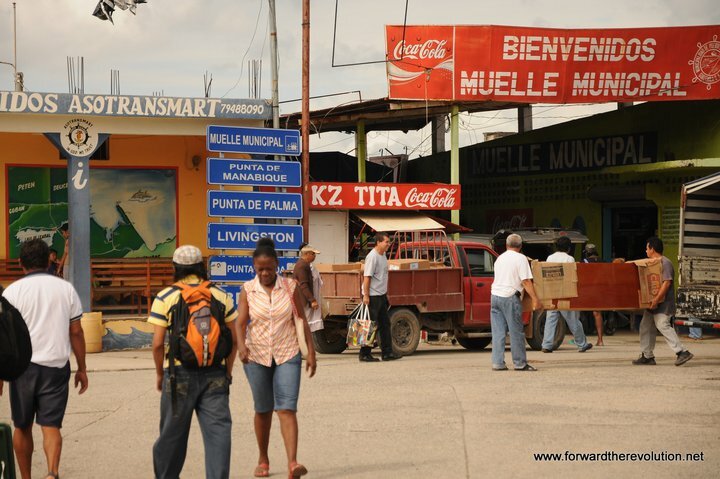 This town is quiet…the atmosphere is strangely different from Honduras…It feels like the place is more alive. We ask a restaurant the permission to use their kitchen to cook some food people had offered us and we have an excellent lunch. Then we head towards the harbor and try to find a way to cross. We need to come back in the morning to talk to the owner of " el Chato". We go to the fire station…our routine…and we obtain a great room with four beds…luxury before a very important day. 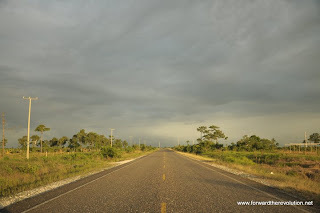 When we get to Belize we know for sure that we will be on time for the climate change summit! In the night, we walked a bit around and discover the black community of the Caribbean coast. They are all very nice, people see us and just talk to us. There is something so special about the Caribbean people…A contrast with the reserved guatemalteques. We recycled some bread…easily in a cosy bakery and we get invited in a restaurant close to the harbor in front of the thousands of Chiquita and Dole refrigerated container, full of fruits, waiting to be chipped to Europe. so much energy, so much resources…and half of what is inside those containers will end up in the trash. In the restaurant we meet the owner of a hotel who invite us for breakfast to meet some of her students. She is also a teacher. We find her in the morning, enjoy a delicious breakfast and meet the local news that had been contacted by her. Interviews, good talks and we all go on our way to the harbor, the journalist insist on following us until the custom office where they organize us another exemption for the departure tax. Easy…then we talk to the owner of "El Chato"…another simple yes coming right away from his heart and we are on our way to Belize! In the meantime, we hear about the death of the grandfather of the journalist. The firemen had told us this mooring two persons were killed near the station and on our way walking to the hotel we had seen another one lying on the street with the police around. 4 deaths in 24 hours…According to the statistics, that the daily death toll of Puerto barrios. We get out of our naive bubble for a while hearing these dramatic news. We need to change. The crossing to Punta Gorda is easy, short with just a little bit of rain on the way. After an hour we land In Belize, we are feeling so close to Cancun, almost there! We are back in the Caribbean world, the atmosphere is super relax…no stress, people chilling in the streets, no fear, quiet and safe. Most of pollution is black and speak a funny English. It feels like in Guyana, people are curious about us and ask us questions, the personality of the people and the lifestyle is so different from the other places of Central America that it feels like we are in another continent. We don't stay long in Punta Gorda, we recycle some bread thanks to a lovely lady and check on a small organization that helps indigenous community to install dry toilets and grow food. 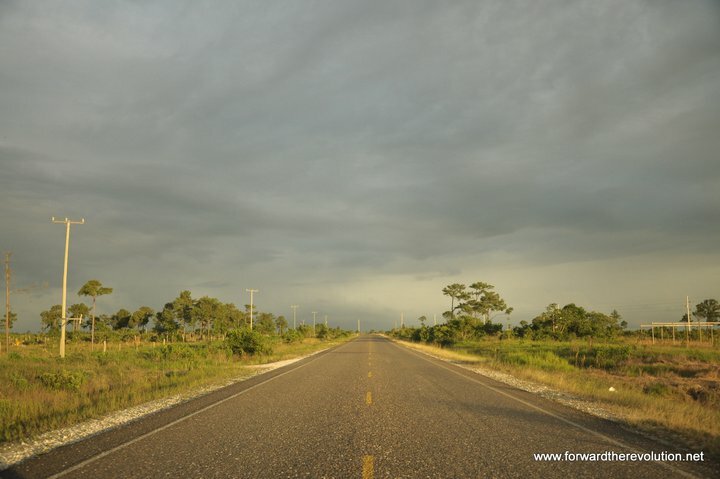 Then we hitchhike…two cars and we are directly on our way to go to Belmopan, the capital of Belize. Easy, and by chance. it is a doctor that take us to the city. He leaves us there at night and we walk around looking for a place to stay. 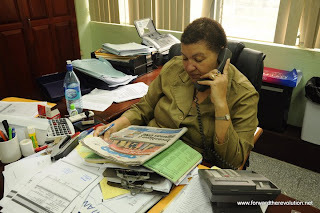 There are only 10 000 people living in Belmopan, the city is essentially the place for the government and public institutions…the fire station is a garage, the red cross is too far…we go to the police and we finally get a ride to sleep in a school. In the morning we go to find our driver because the girls felt sick in Honduras…it has been a week now and the pain doesn't go away. He is great and gave us a "laisser-passer" to go to the hospital and the girls can be checked by a doctor. One of our goal in this city was to find the way to get an exemption for tourist tax that they ask you when you leave the country. We ask the reception and after knocking on various door we finally get to meet a friendly lady who takes care of the taxes in the country. She listens to the story with calm and interest and agree simply on according us an exemption. Some phone calls around and an hour later she receive a fax with our names on it. She sent one as well to the border and we just have to go there! That's the advantage with the small republic, it is easy to get to talk to the right person! So easy…if the world was managed this way we would probably have less problems. We are back not he road, happy! Thanks to a french hotel owner we get in no time to Belize City, the old capital where the people are. After a hurricane they had transferred the government in Belmopan for security…but Belize is the real center of the country. The atmosphere is nice there, we try to talk to newspapers but people are too relax to make it happen. We recycle some great Caribbean food, people are generous and we connect ourselves with a friend of a friend, Alejandro who invite us to his big flat and give us a great time and a good rest! The firemen and the Red Cross couldn't really help us there. In the morning, we pass by the television and make a small interview and we hit back the road…easy…we get quickly through the country crossing huge fields of Palm oil, and sugar cane. The people are nice, the situation is complicated in Belize, less than 400 000 inhabitants, a family corruption because every one know each other. Economically, there are not doing great although no one is really able to tell s what's wrong, people don't really have any idea about politics and don't get too interested. Life is about something else, enjoying the moment and let go! Crossing the border is not a problem, we just have to say our names ad show our passport and the fax had been received, we are out of the country…and in Mexico!!! It is hard to write about this moment that cannot be tell. 11 months of an intense journey, more than 300 days thinking about one thing: Mexico. We have been waiting so long for this moment that we don't even know how to feel. We are there, in Mexico…in time for the Climate change summit and ready to forward the revolution in one of the most fascinating country of the world!